What happens when you walk past a vintage piece of linen? You stop in your tracks, back up, and take it home with you! This is the piece that I found, and it just spoke to me.... 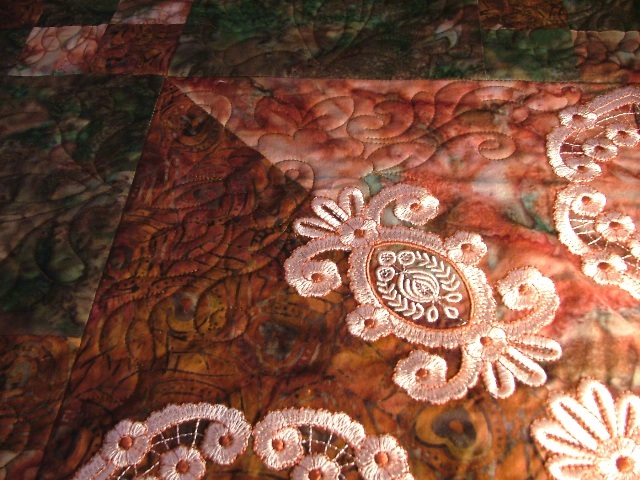 I envisioned quilting this piece, and adding to the life of something that had been lovingly stitched many years ago. Adding three layers behind the original, I began the journey of joy. The piece already had hand-stitched carnations and a beautiful crocheted border along the edge. I wanted to keep those features, and also highlight the hand-stitched bow and fan details. I added lots of quilting, and I am very happy with the results! 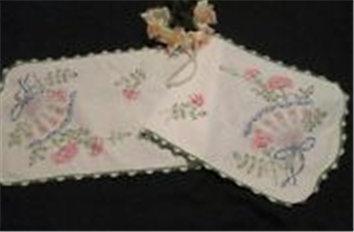 This vintage table runner has now been added to the Quilts for Sale category! Only $175.00 for a short time, offering you an introductory price! Update: The Vintage Table Runner has been sold! Truly a labor of love, this quilt was a combination of log cabin blocks and printed panels featuring butterflies and flowers that are so realistic! Pieced by Lyn Christian of A Design by Lyn and quilted by Candy Apple Quilts, this quilt is a treasure. It finishes at 90 inches square --- perfect for a queen sized bed. 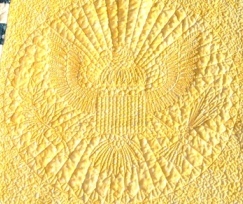 Be sure to see all of the pictures so you can examine the quilt in detail. Price is $1,000 plus shipping costs --- continental US only please. 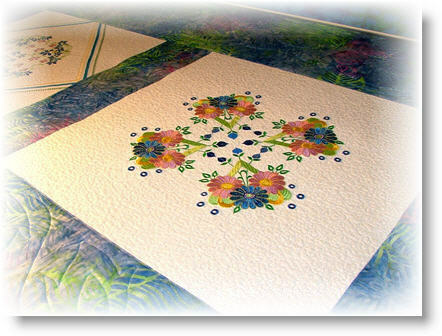 Update: The Sketches of Spring Quilt has been sold. 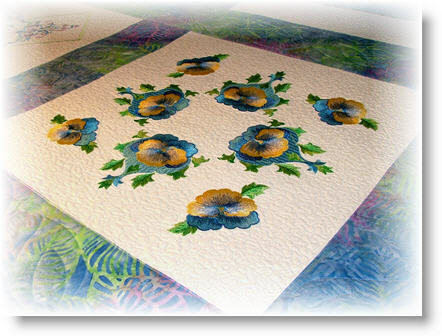 It all started when I read Linda Poole's newest book called Painted Applique. I've included a link at the bottom, because you are going to want this book! I knew that I would become addicted to applique, and that's exactly what has happened! Linda has beautiful projects in her newest book, and I just fell in love with the one called Ring of Posies. There were various techniques that I have been wanting to try, and having lots of white space enabled me to do just that. Surprisingly, the first area I considered was the outer corners. I knew this wall-hanging would need to lay flat against the wall, so I wanted something that would be even and stable. I decided on a one-inch grid. That's one of my favorites. Since feathers are my absolute favorite, and just had to add the circular feather wreath design in the center. And speaking of the center, this ring of posies is not perfectly circular, which (in my opinion) makes it perfect! It's much easier to feature a design in the center of something if you don't have to fret over whether all of the circular elements are perfectly aligned. I extended the feathered wreath by echoing it. As you can see in the pictures, some of the echoing travels out further in some parts than in other parts. Being able to do that just added to the fun! I knew that I wanted to have some micro-stippling close to the applique, just to make it pop up a bit. Or, save some time and purchase the finished 40 x 40 wall-hanging! 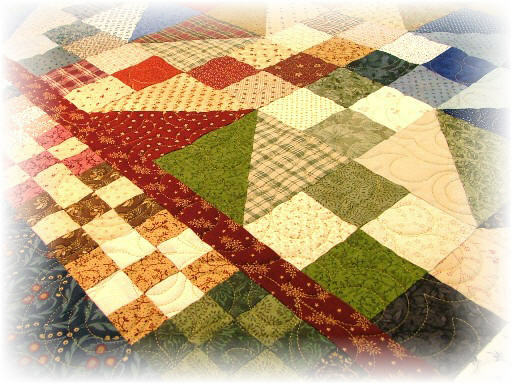 Available for a short time only, this quilt is priced at $275.00 including shipping to your location inside the continental United States only. Update: Quilt has been sold! It was an honor and a privilege to make this quilt! Measuring 55 by 48, it’s a contemporary version of the American flag. 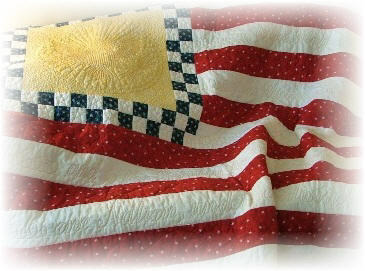 There's nothing better than this quilt to honor a veteran. The pattern is available in our store and you can even request that your quilt be done just like this one --- including all of the words to the Pledge of Allegiance in the white stripes of the flag. Just perfect for a baby boy, our Baby Boy Bunny Quilt is ready for gift-giving. This quilt measures 41 inches by 41 inches -- just the right size for snuggling with your precious new angel. There is a soft shade of blue 100% cotton fabric, and a white Kona cotton solid, and subtle blue quilting thread. 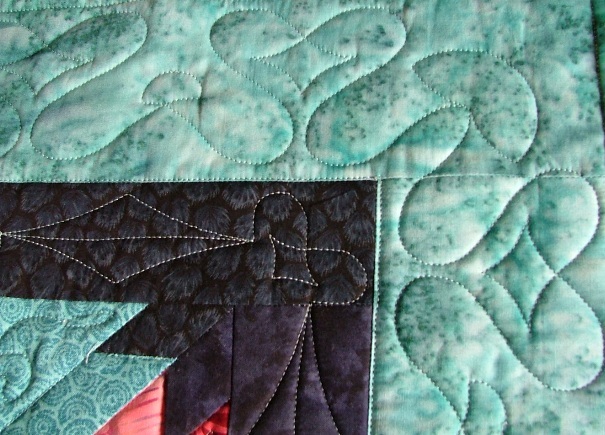 The border features a double heart stitched in each section. 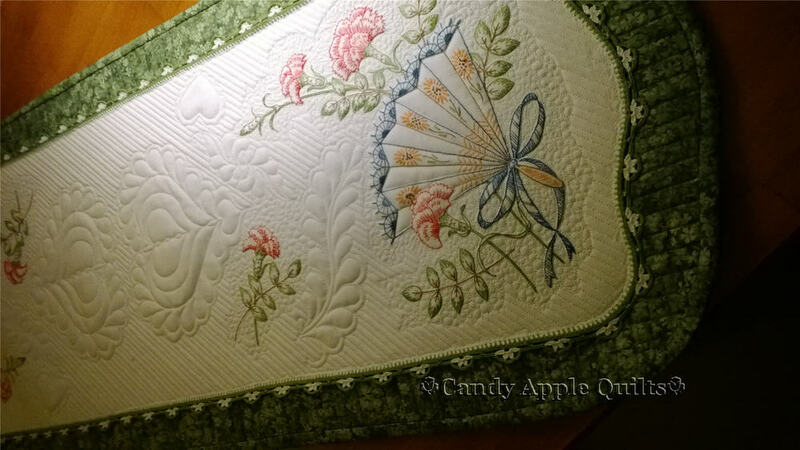 The binding is finished completely by hand, with the quality that you have come to expect from Candy Apple Quilts. Small hearts are stitched in the block center areas -- and the center square has a beautiful quilted bunny design. This quilt is as pretty on the back is it is on the front. Please click on each of the pictures below to enlarge them, and look at the fine details. This item has a 100% satisfaction guarantee! 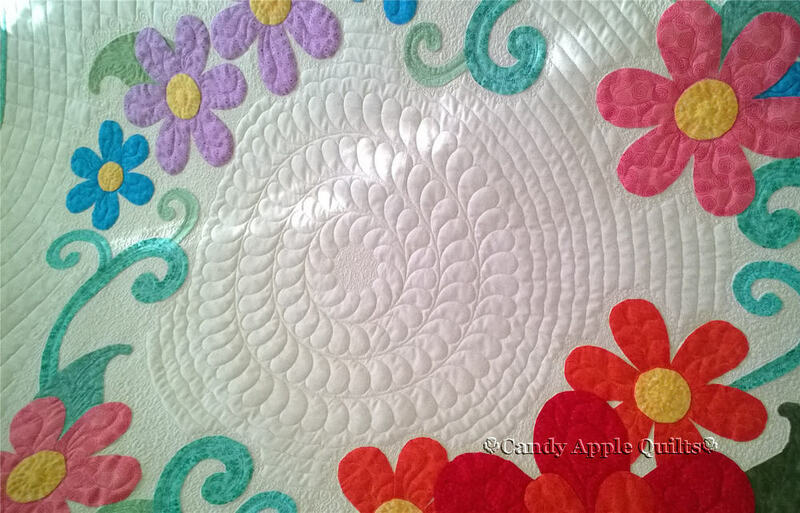 If you aren't happy for any reason, just return the quilt to Candy Apple Quilts in it's original condition, and you will receive a refund of your purchase price. Order yours today to have on hand as a perfect gift. Just 199.99 plus shipping. Only one available, so order quickly! 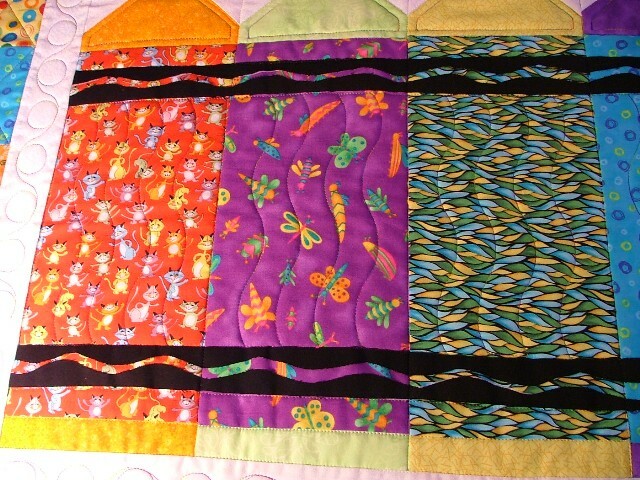 ITEM SOLD — PLEASE WATCH FOR OTHER QUILTS AVAILABLE SOON! Just perfect for a baby girl, our Baby Girl Bunny Quilt is ready for gift-giving. This quilt measures 42 inches by 42 inches -- just the right size for snuggling with your precious new angel. There is a soft shade of pink 100% cotton fabric, and a white Kona cotton solid, and subtle pink quilting thread. 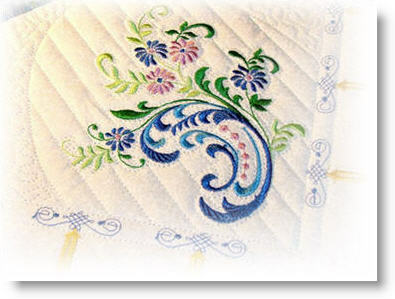 The border features a double heart stitched in each section. 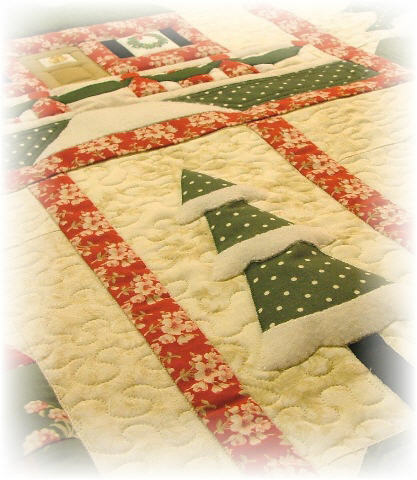 The binding is finished completely by hand, with the quality that you have come to expect from Candy Apple Quilts. 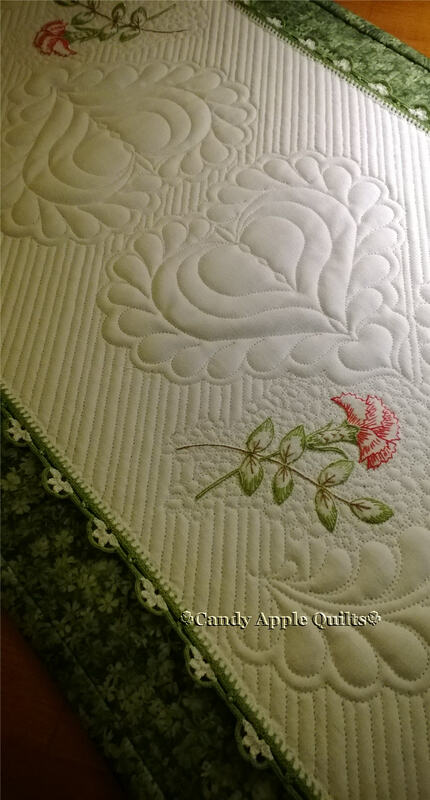 Small hearts are stitched in the block center areas -- and the center square has a beautiful quilted bunny design. This quilt is as pretty on the back is it is on the front. Please click on each of the pictures below to enlarge them, and look at the fine details. This item has a 100% satisfaction guarantee! If you aren't happy for any reason, just return the quilt to Candy Apple Quilts in it's original condition, and you will receive a refund of your purchase price. Order yours today to have on hand as a perfect gift. Just 199.99 plus shipping. Only one available, so order quickly! 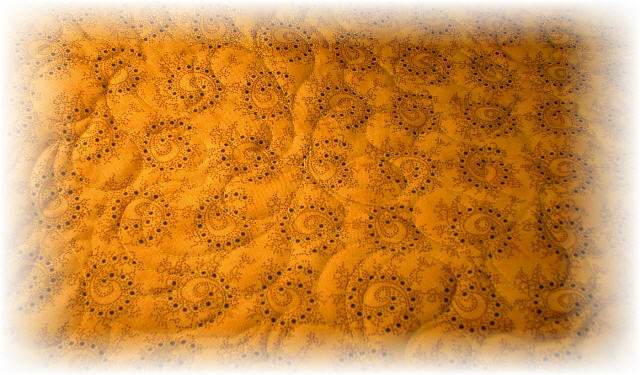 ITEM SOLD -- PLEASE WATCH FOR OTHER QUILTS AVAILABLE SOON! We've had so many requests for finished quilts! In response to those requests, we have decided to start featuring completed quilts, and making them available to you for purchase. Just in time for Valentine's Day, our Love Quilt is the first quilt in a new venture for Candy Apple Quilts! This quilt measures 60 inches by 53 inches -- just the right size for snuggling with your sweetheart. There are eight different shades of red and pink 100% cotton fabrics. 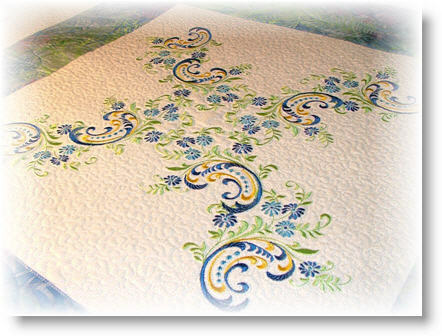 The border features a double heart stitched in each section, with a scalloped outer edge. 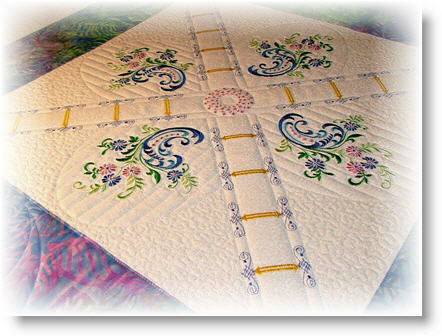 The binding is finished completely by hand, with the quality that you have come to expect from Candy Apple Quilts. 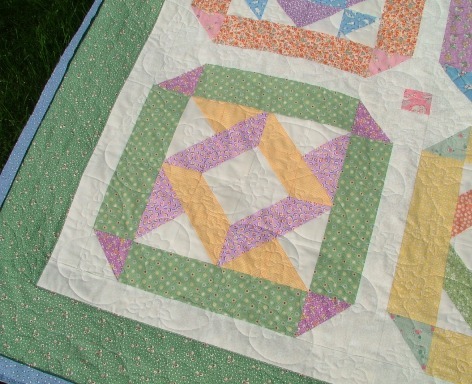 Small hearts are stitched in the center area -- and the center square has a light feather design. Please click on each of the pictures below to enlarge them, and look at the fine details. This item has a 100% satisfaction guarantee! 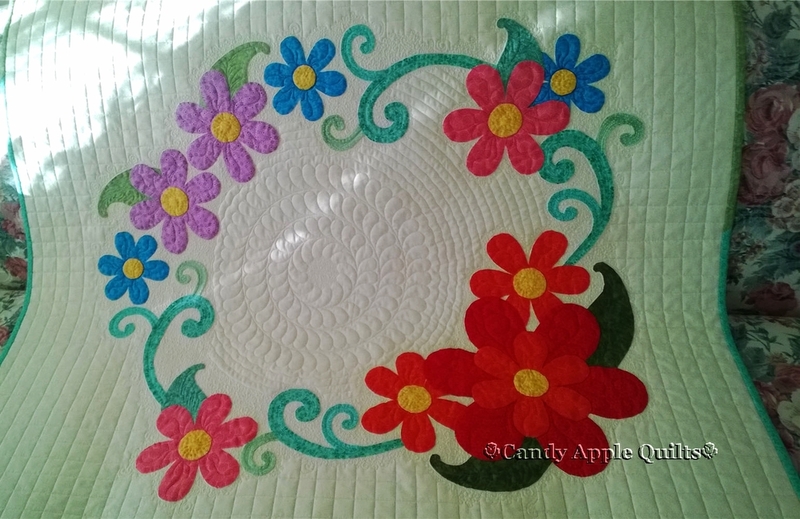 If you aren't happy for any reason, just return the quilt to Candy Apple Quilts in it's original condition, and you will receive a refund of your purchase price. Order yours today to receive it in time for Valentine's Day. Just 299.99 plus shipping. Only one available, so order quickly! I received a Quilt In a Cup kit from my friend Dawn the other day --- and it was so much fun to make! The kit comes with a white inner liner, a clear acrylic outside piece, batting, a template, a lid and a straw. You can use any scraps you have, and place them however you would like on the batting. Then just use a log cabin method of adding pieces in a clock-wise fashion until you have covered the entire piece of batting. You only need to finish one side with a binding because the other side won't show from the outside. Then collect all of your pieces, and a bottle of white glue. I didn't follow all of the directions, because I didn't want the piece permanently glued inside of the cup. 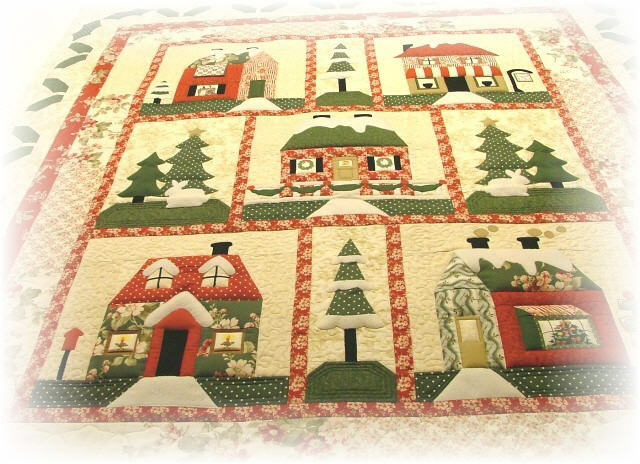 I want to be able to change my little quilted piece with the seasons. The only place that I used glue was down the length of the side binding. When I was all done, my finished cup was ready to fill with coffee (or a cold beverage). This was so much fun to make! The secret to an amazing quilt? The inside. That's right --- the part that no one can see. 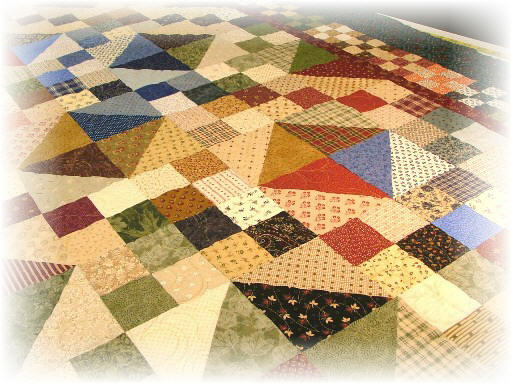 Connie pressed each tiny block in this quilt, and paid a lot of attention to the squaring of each block, and the direction of her seams. 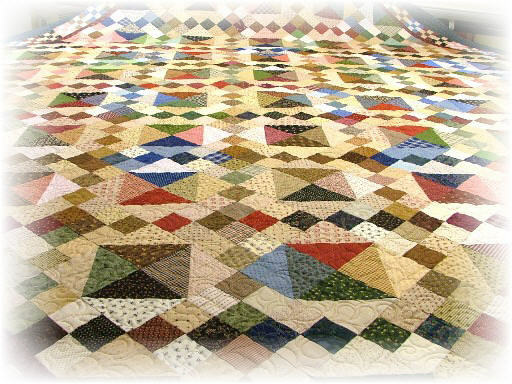 When she joined each block together she made sure to alternate her seam allowances, and there are no lumpy areas in this quilt. Waiting until the end of piecing the quilt top) or even the piecing of just one row SEEMS like a time-saver, but in reality you save time by taking care of each tiny issue along the way. This reminds me of something a house painter explained to me years ago. "A wall can only look good painted if it's smooth before the paint is applied. If you paint over all of the lumps and bumps, trying to hide them, you'll still be able to see them in the end." 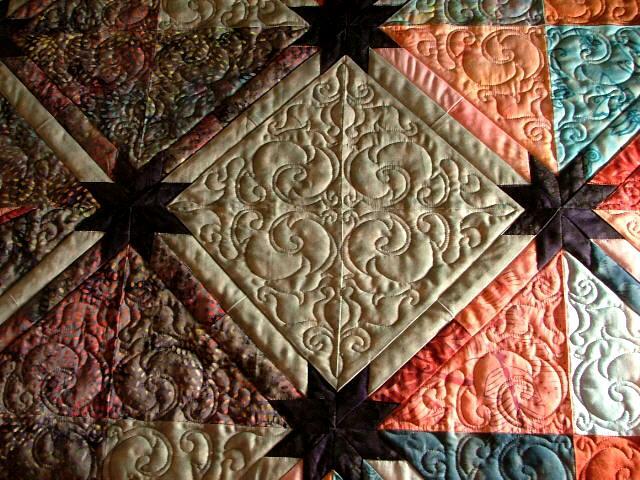 Adding a feathered over-all design to this quilt in a nice even density enables the eye to go to Connie's accurate piecing and enjoy her vast selection of fabrics. It also makes the back of the quilt as pretty as the front. 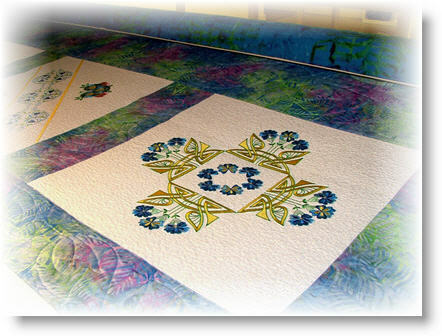 This quilt measures 103 inches square, and will be used and washed frequently. An over-all design is perfectly suited for a high-use quilt. Connie's quilt also reminds me of something that George Washington said because I firmly believe in this principal.... people won't remember how QUICKLY you did something, they will remember how WELL you did it. Relax and take a little extra time pressing along the way, and enjoy your piecing. Years later, you'll be happy you did! I love vintage quilts, and I love 1930's reproduction fabrics! 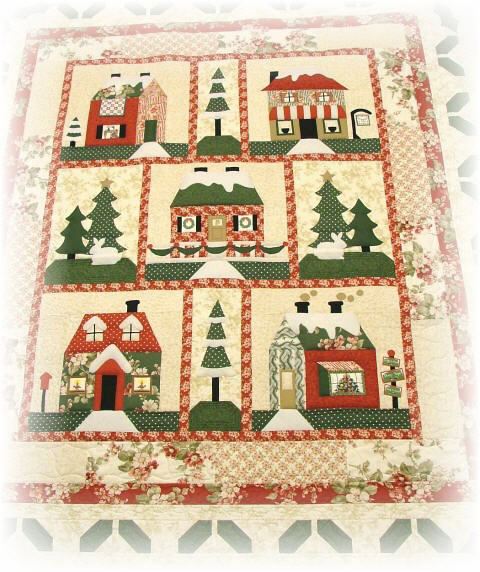 This pretty quilt was done by Susan Mars, owner of All About Blanks, where you can see the most gorgeous linens and holiday items. Susan is so creative, and she created the layout for this quilt by combining the best ideas from different sources and sprinkling them with her imagination! "The idea for this quilt began as a Block of the month club from Grandma's Attic." 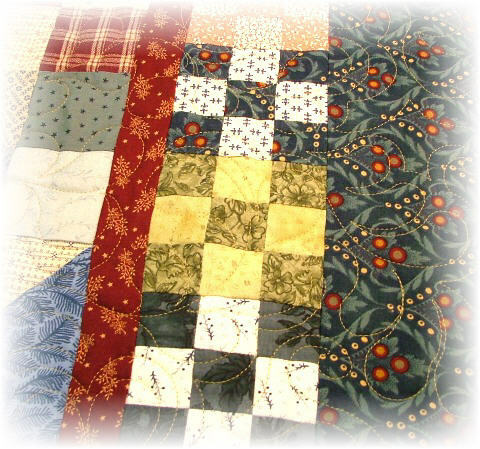 Wanting to expand upon the idea, and do something fun with the setting, Susan went to Block Central and found an idea in the 2008 "Somewhere In Time" quilt. Says Susan, "...it worked out PERFECTLY for my 1930's block of the month. I made it a little scrappy, using a variety of the 1930's repros for my sashing. I adore the way it turned out. I have always wanted to do a 1930's reproduction quilt ...". Susan, I love your approach! 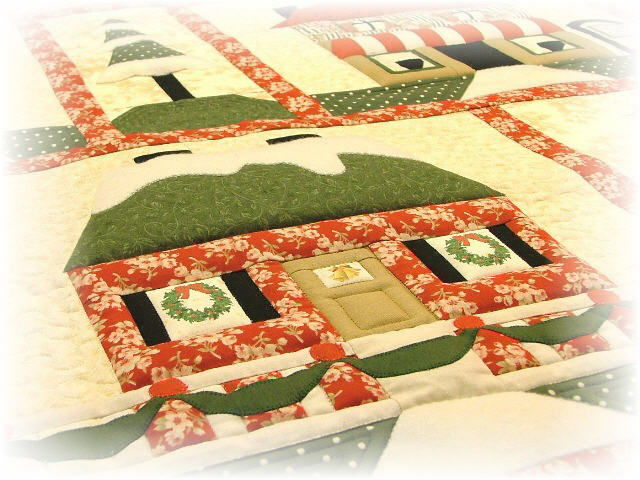 Christmas is my favorite time of year, and this quilt tops my list of things that can make me start singing Christmas carols! 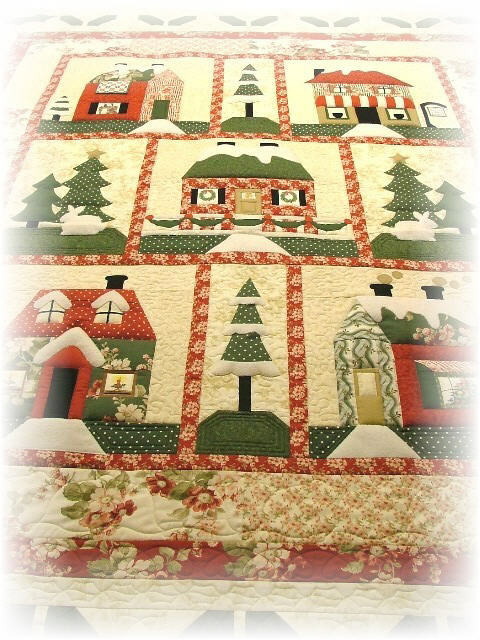 While working on this beautiful quilt, I could imagine cookies baking, twinkling lights, and the sound of jingle bells. Bev did a beautiful job piecing this quilt from The Quilt Company, and it was truly a joy for me to do the quilting on it! The quilt is called Holly Lane, and you can see it here. We decided to use Christmas bells, holly leaves, hearts, and stars in the separate borders to add even more fun to the quilt. Each of the four corners has a crisp snowflake. Bev still has a little more work to do. There are red buttons to be sewn on all the way around the outer border, tiny door knobs to add, slower buttons in the windows, and hand-stitched smoke from one of the chimneys. 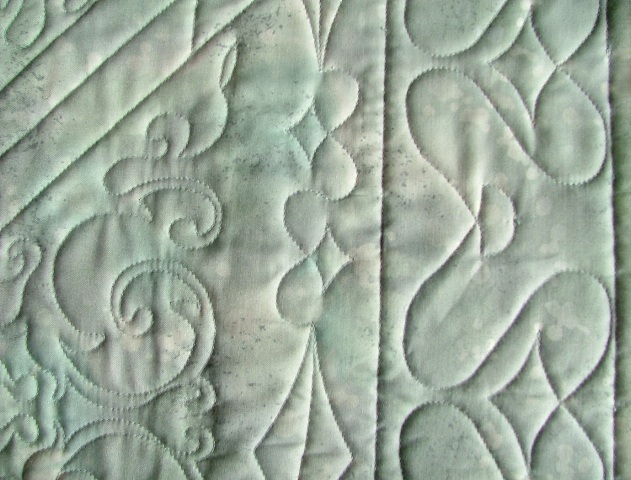 A dark green binding will finish the edges of this quilt. Each house features a layer of high-loft polyester batting to make it really stand out from the background. I can just imagine how this happened..... Linda's mother started piecing this Lone Star back in 1939. Sometimes, life gets in the way, and she set it aside for "someday". Years go by, and Mom passed away. Linda and her sister were going through some of Mom's possessions, and they found this project --- that was back in the 1980's. Linda decided that she would be the one to finish this quilt... for Mom. Years pass again, and the project was set aside... again. Just recently, Linda decided to finish this quilt for her daughter. 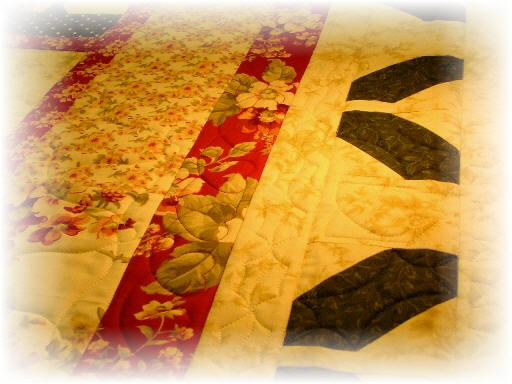 When she looked at the quilt top, she noticed that the white fabrics were starting to disintegrate from age. She lovingly replaced all of the white fabric, and brought it over for me to quilt it for her. I was honored (and thrilled!) to be able to finish this quilt! When the binding is put on, it will be displayed with antique photos of.... Mom. How fitting. Karen decided to make a quilt full of color for a special gift. I love the fabrics she chose for this one! There is every color of the rainbow here --- and that made it hard to choose a thread color. As a solution, we chose all of them! Variegated threads can be so much fun on a white background. It blends well on all of the colored crayons in this quilt -- even the crayon tips that were almost solid colors. The special part is the border of variegated elephants walking around the outer border, holding the tail in front of the next elephant. Click on each picture to see more detail. You can click a second time to make the pictures larger. There's nothing better than having someone come to pick up her quilt, and having her give me a giant hug! Karen worked hard on this adorable quilt for her little grand-daughter, and it was worth every minute. 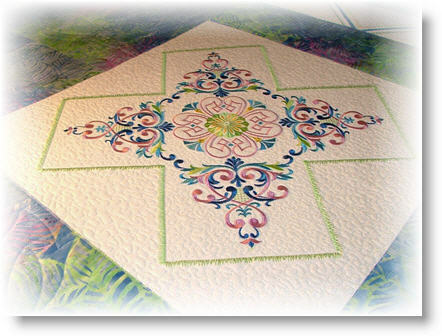 Her piecing is perfect, the applique is precise and smooth, and the finished project is wonderful! Karen wanted to have a quilting design that reflected something to go along with the puppy theme. We chose a design from Vickie Maleski that has small bones and paw prints. 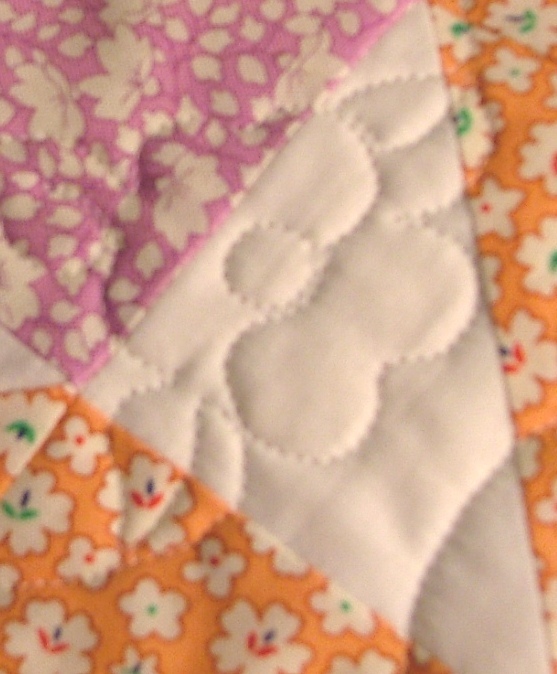 She requested that there be no quilting on the puppy appliques that surround the outer border. All the quilting was done to surround the puppys, but not stitch over them. Karen is deciding if she would like to leave the puppys unquilted (as shown in the original pattern), or if she would like to add some hand quilting to them. The quilt is adorable just as it is, but the nice thing about adding hand-quilting is that she can add it at a later date, even after the quilt has been laundered numerous times. Now that's flexibility! The Baby's Bow Wow Blankie pattern was created by Bonnie Sullivan of All Through the Night Folk Art Designs, and is available by clicking here. 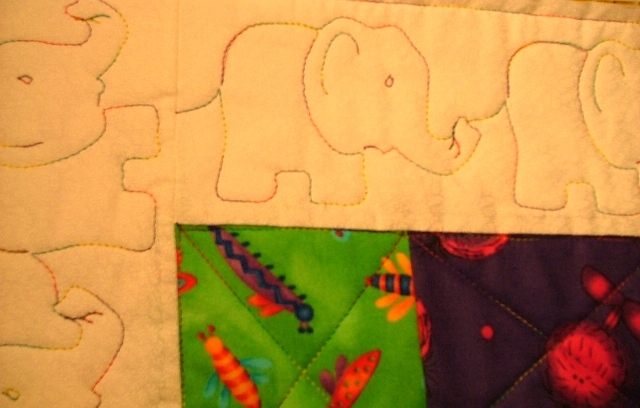 Be sure to click on the pictures below to see more of Karen's quilt project! I wanted blocks that pertained to my daughter, such as "Eyes of Blue" and "March Winds" and "Puppy Love" --- things that were special to her at the time. I started this quilt with ten-inch blocks, hand-quilting each one with a "quilt as you go" approach. After a short time, I decided that it would take too long to finish this quilt, even though it would only be sized for a twin bed. I made a trip to the local copy shop, and had the patterns enlarged substantially. I cut the pieces from these larger patterns, and used the larger seam allowance shown on the new templates. Time went by, and life got in the way. Another daughter came along, and this project was hung up in the closet to finish later. All of the blocks were pieced, and hanging up on clip-type pants hangers. Now that my oldest daughter is a mother, and my parents have passed away, I felt it was important to finish this quilt. I joined all of the blocks together, including the ones that had already been hand-quilted. Using Creative Studio with my Statler Stitcher, I was able to choose quilting patterns AND create new patterns from elements contained within the original ones. This quilt will be a gift to my grandson this year. He will be moving out of his crib, and into his first "big-boy bed", and he will be able to enjoy the colors of the quilt that his great-grandparents chose with love. Don't throw it away -- SEW it away! Don't give up on that project! Reading the book "That Dorky Homemade Look" by Lisa Boyer has really energized me to finish my UFO's. How could I resist buying her book when her first "Principle of Dorky Quiltmaking" is to buy fabric that you "feel sorry for"! That is soooo ----- ME! Many times I've bought something that I thought would make an adorable project, and my husband and kids would look at me like I had finally gone over the edge. I would dive head-first into my idea, get half-way through the project, and then run out of steam. Whether it was my own creation, or whether I was following a pattern, sometimes things just didn't look quite right. Quoting Lisa Boyer, "Enjoy the process. Don't worry about judgements, and realize that the rules are something you can embrace or reject at will, whatever suits you. 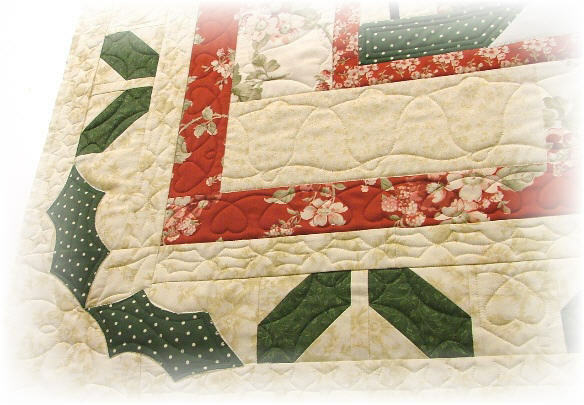 Quilting styles, fabric colors, opinions and rules change with time. The only truly lasting thing in a quilt is the love you sew into it." How many times have you gotten half way through a project, and then gave up? It just wasn't turning out the way you expected that it would. The disappointment was strong, and it was easier to toss the project aside than it was to think about wasting any more time finishing. it. After all, you thought.... how could it possibly get any better if it looks this bad now? Of course, then the guilt sets in --- and you think of not just the time that has been wasted, but also the money for all of the materials that are in your project. Occasionally, you question your own skill set, thinking that your project doesn't even resemble the picture on the front of the pattern! If this ever happens to you, try to find a box to store this project, and consider finishing it someday. Why store it in a box? Because throwing everything into a bag just leads to having the contents become wrinkled and messy. If everything is in a box, ready to begin work again, chances are that you will want to "play" with this project. Store the fabric, any pieces that have been cut, embellishments, the patterns, etc. in your box. A clean pizza box can be wonderful for this. Next time you are in the pizza shop, get a few boxes for yourself. You can label the top or front with the project name, and stack the boxes neatly on a shelf. Almost every project is worth finishing, even if you use the item for a different plan than the original idea. Taking a break from the frustration can give you a fresh outlook, and you can return to finish the project sooner if you actually "can't see it" for a few days. Consider the project below. Susan bought a pattern for a beautiful Asian wall-hanging. She carefully chose a printed panel and all of the coordinating fabrics, trims, medallions, border fabric, backing, batting, and metallic thread. Following the directions closely, she executed every step with careful consideration. The piecing was perfect. All of the ribbons were inserted in the correct places. Even a soft satin binding was added to the outer edge. But for some reason, Susan wasn't pleased with all of the work she had done on her project. The directions called for stitch in the ditch between blocks, and stitching around the graceful flying cranes with metallic thread. All of the steps were done perfectly, yet Susan felt something "just wasn't right" with her finished project, and it had been tossed aside for many months. Last week, she brought the wall-hanging to my studio for my opinion. After one glance, I decided that the thick fluffy polyester batting was the culprit. While it served the intended purpose of making the detail stand out on the flying cranes, it also made the entire background puffy. The outer borders were five inches wide, and without any quilting inside to hold the layers together, each one looked slightly lumpy. The weight of the metal medallions pulled on the fabric, and without any support, the fabrics in those two squares hung there limply. Each of the squares looked pretty.... but again, puffy. We had to plan a way to save this project. In it's current condition, Susan didn't want to hang it up on her wall. We looked through lots of designs for the various areas, and chose patterns and borders to add to her project. Two of the medallions that were on the quilt were glued on, and could not be removed, so we had to plan around those. Also, there were ribbons and braid to avoid. I love a challenge! I've had many projects come through the door that just need a little bit more work to make them truly finished. When Susan came to pick up her wall-hanging, she was jumping for joy. Her Asian wall-hanging had been set aside for months, and now it's ready to hang. A few days later, she wrote to me saying "You inspired me to try another quilt! Thank you from my heart! " It's a great feeling of accomplishment to finish a project. Having my partially completed projects neatly organized has helped me to finish some that I had thought would never be finished. Some of my UFO's have become gifts, and other's have been donated to charity upon completion. I will always remember Lisa Boyer's words of wisdom: "The only truly lasting thing in a quilt is the love you sew into it." And for another great book by Lisa Boyer, check out "Stash Envy and other Quilting Confessions and Adventures"! Tons of beautiful batiks --- and lots of patience! The black pieced stars in the corners of the blocks are only 2 inches across. 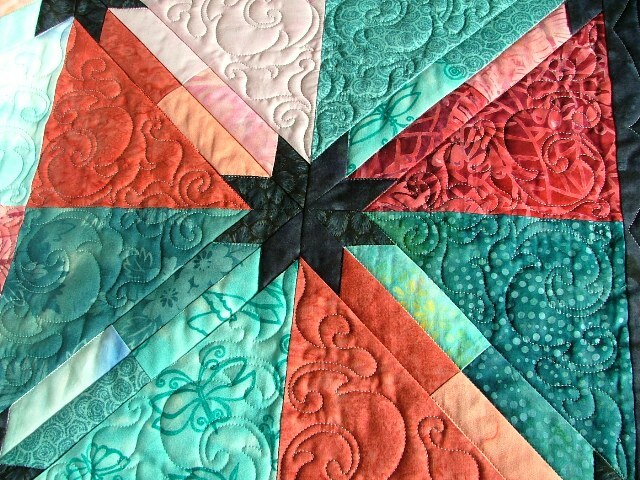 Ronnie wanted the stars to "pop", so there is stitch-in-the-ditch around each segment. The sashes are ditch-stitched, too. 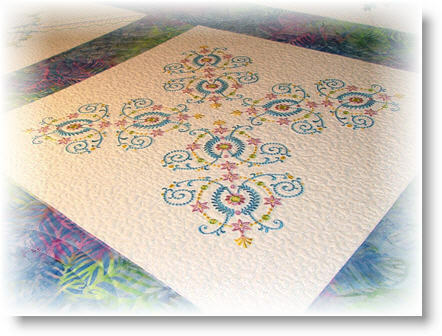 The quilting designs are from the Enchanted Collection from Anne Bright. I was intrigued with finding a faster way to create all of the half-square triangles that would be needed for the center section, and for the border. Using a Gammill machine with a Statler Stitcher enabled me to do most of the work with the computer! I put a solid white fabric on the machine first. Then, I placed a strip of floral fabric right side down on the white fabric with a pin at each end to hold it in place. Using the computer, I set up all of the sewing for the half square triangles.I then cut the strips apart and ironed the pieces open to create all of the pieces I needed for the pinwheels. When all of the pinwheels were complete, it didn't take long to sew them together into the center portion of the quilt. From the various green fabrics, I cut all of the leaves for the appliqued border. All of the applique was done by hand. Back to the quilting machine with more white fabric, and a pretty lime green. All of the half square triangles were laid out in advance, and sewn row after row, non-stop. After cutting the rows and blocks apart, I had all of the half square triangles that I needed for the outer border of the quilt! The only job left was to measure the applique borders and the outer borders, and apply them. I added the binding, sprinkled a few yo-yos on for fun, and it's done! Click on the images below to see the full-sized pictures. This pattern for the quilt is available from McCall's Magazine. For the half square triangle Statler pattern, please email Gary and Linda Schmitz at ewok335@centurytel.net, or check their web site for patterns. 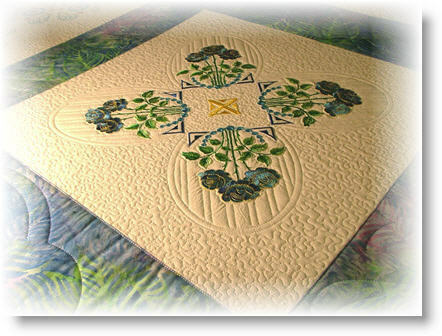 This beautiful quilt was created by Priscilla Madsen of Madsen Originals. The lace embroidery is spectacular! 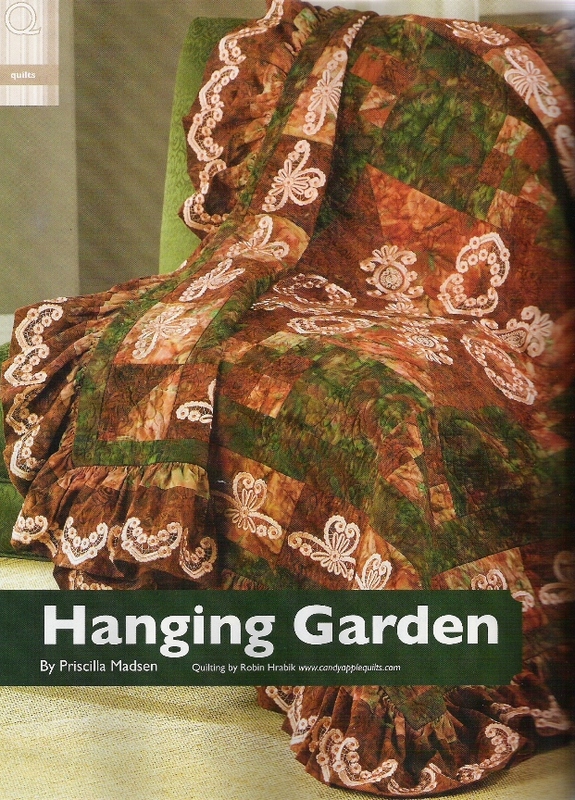 It was just published in the most recent issue of Designs in Embroidery Magazine. I'd like to share some close-up pictures with you, so you can see the quality of the stitching. Click on the image to have it open on a new page. Then, click on the image again, and you will be able to see a larger version. It was a real pleasure to do the quilting for this project! Priscilla is wonderful to work with -- and so talented!